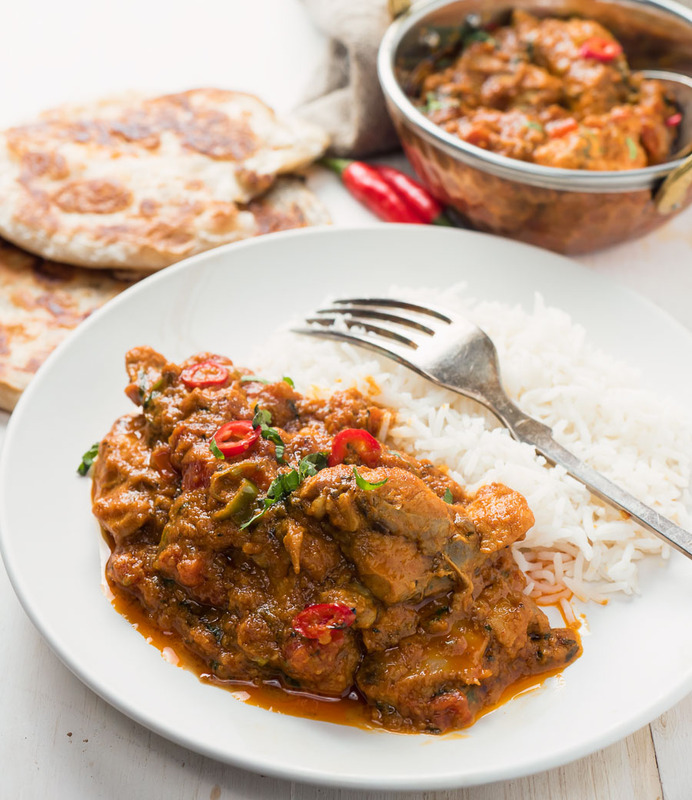 Karahi chicken curry done restaurant style. 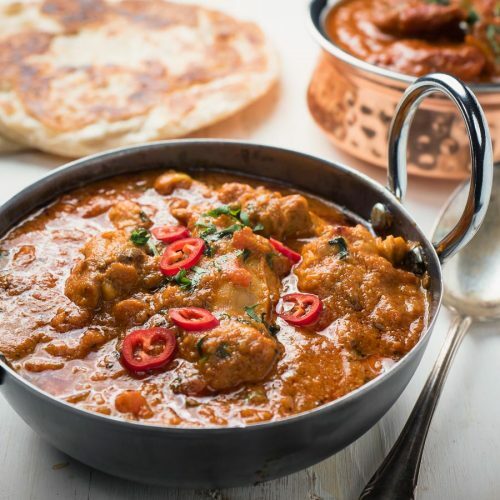 All the great tastes of classic karahi chicken with that thick, rich gravy you only get in restaurants. This is a Northern Indian street food classic adapted to restaurant style cooking. Like you would get in a restaurant. Not like you usually make at home. I like karahi chicken done homestyle. 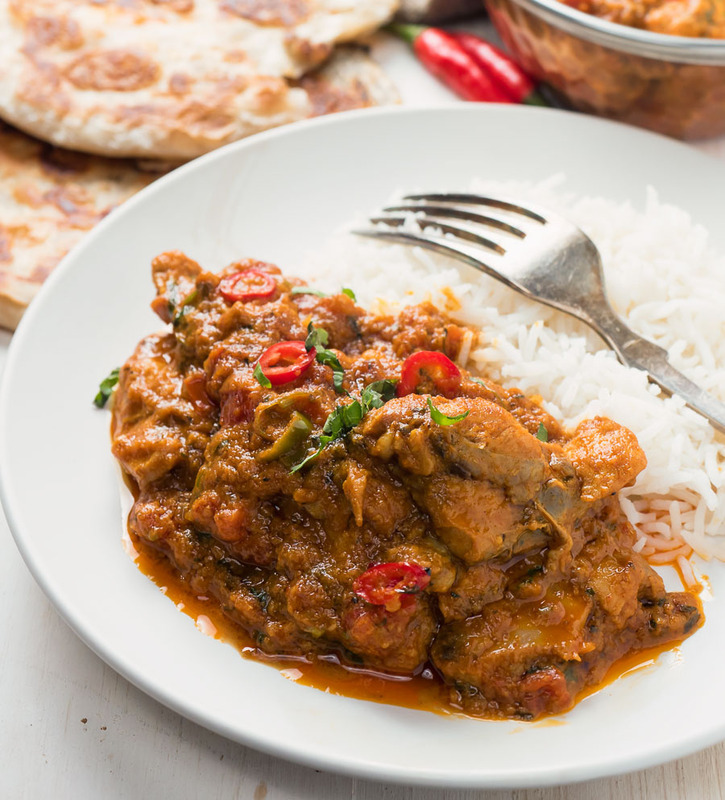 It’s a relatively simple curry but it has great balance. And it’s a bit different. But when I make it restaurant style I like it better. There’s something about the luscious restaurant style sauce that works really well with the brightness of the fresh tomatoes. The cream adds a bit of richness. Upscales it. Karahi chicken is little different than the usual suspects. But you can’t live on jalfrezi and tikka masala forever. At least I can’t. There are about a million regional dishes in India. OK. Maybe that’s a slight exaggeration. I have a book I bought in India that has around 1600. In one book. One book! But you only see the same 30 things on every Indian restaurant menu. Over and over. Why? It’s boring. A bit dull. They are some of the greats, mind you. A good rogan josh or madras is a wonderful thing. But come on. Mix it up. Try something new. A billion people can’t be wrong. This is something new. I like new. I’ve seen it at a couple of restaurants. But not many. Pretty rare. Don’t think I’ve ever seen in my home town. But it has the homestyle tastes. The classic mom in the kitchen cooking up a storm tastes. Nothing unusual here. Just simple ingredients put together in a way that works. And the nice thing about karahi chicken is it doesn’t call for a bunch of ingredients you’ve never heard of. The spices are straightforward. You can get almost everything from your local grocery store. The fenugreek leaves are the only oddball ingredient. You might have to hit an Indian grocer to get them. But they add a certain something. So make the effort to get some if you can. 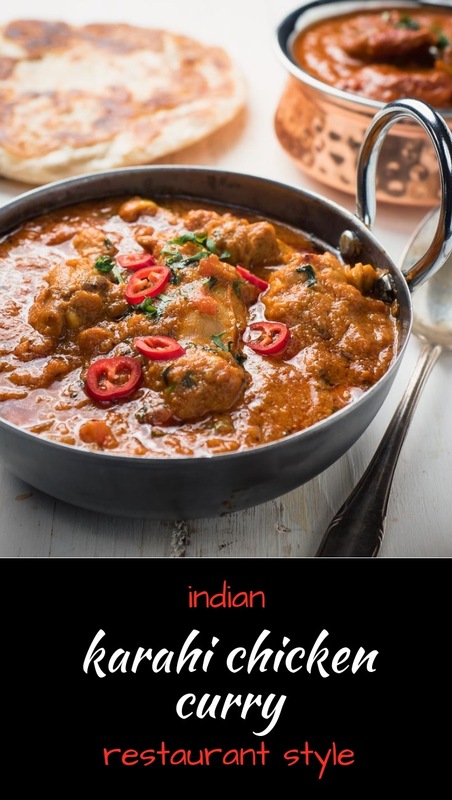 If you are new to Indian restaurant cooking the big classic dishes will be all you will want to cook. That’s natural. But if you’ve been at it for a while. If you are looking to mix it up. And if you like homestyle Indian as well as restaurant curries. 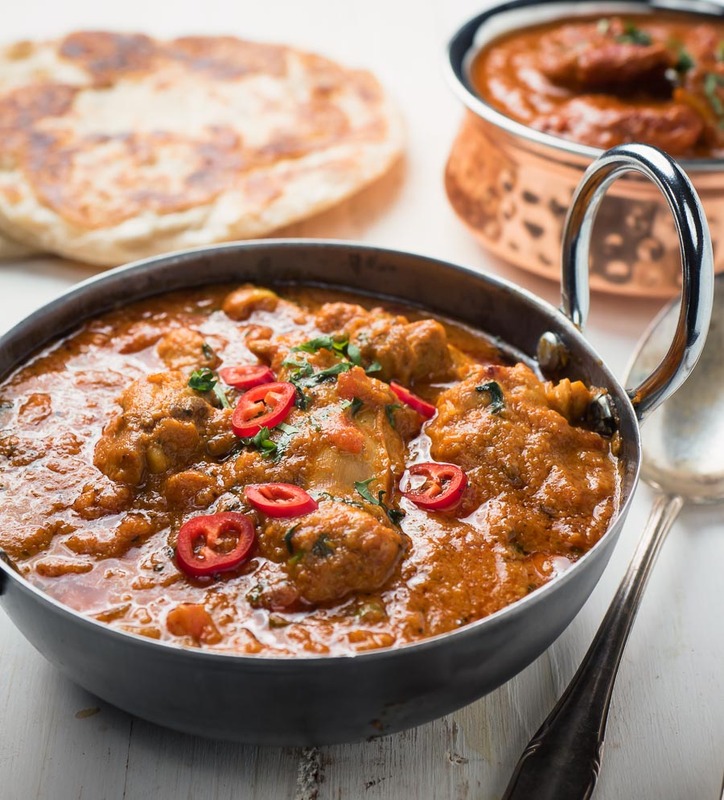 Then karahi chicken is a great one to try. 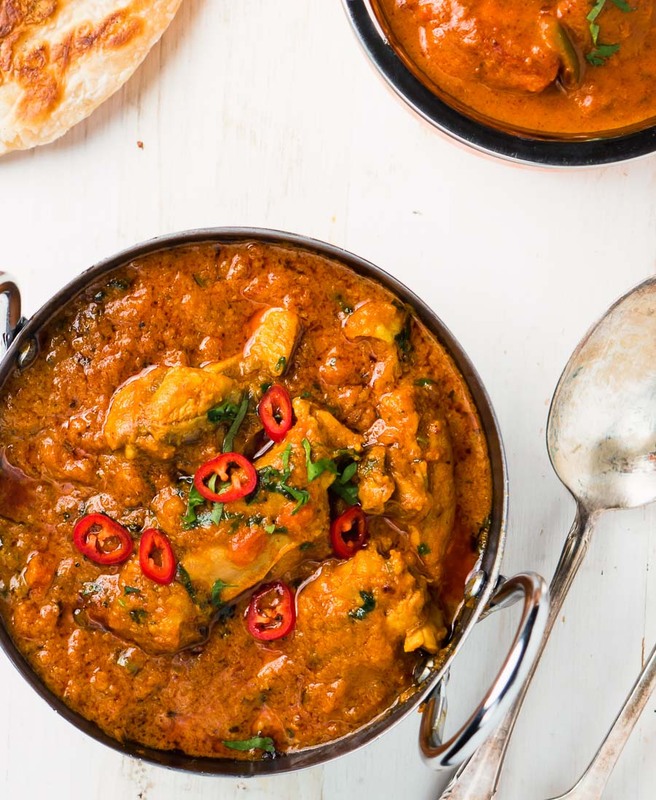 Get those great karahi chicken curry flavours with the rich, lush sauce you only get in restaurants. Add the chicken, curry powder and salt to a small pot. Cover with chicken stock and bring to a simmer. Cook until the chicken is just done. This takes about 10-12 minutes. Drain the chicken and set aside. Heat a non-stick frying pan over medium heat. Add the oil. When the oil starts to shimmer add the onion and green chilies. Cook, stirring constantly, until the onions just start to brown on the edges. This takes 2-3 minutes. Add the diluted tomato paste. Stir to combine and cook for about a minute. Now add the remaining curry base. Cook until it craters and reduce the heat to low. Add the chicken stir to mix. Simmer for about 3 minutes. Add the fresh chopped tomatoes, cilantro and lemon juice and cook for another 2 minutes or so. If the curry gets too dry add a bit more curry base. Add the cream. Stir to combine. Serve. Enjoy! If you haven't read about Indian restaurant technique yet, do that before you start cooking. Have all your ingredients prepped and ready to go. I’ll have to try your yoghurt idea soon! Glad you liked it.